Imagine being able to pull over for a cup of tea… whenever you want! 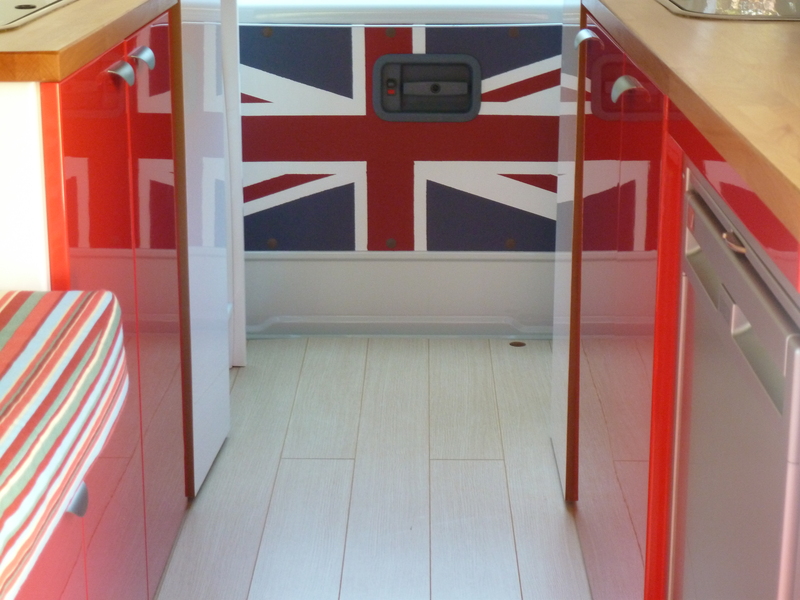 We’ve been neglecting the campervan a bit of late; the last few months have flown in an endless flurry of jubilee street parties and Olympic fever (not really, but it does explain the rest of the story). One of the final jobs left in the campervan was to paint the inside back door in the bathroom white. 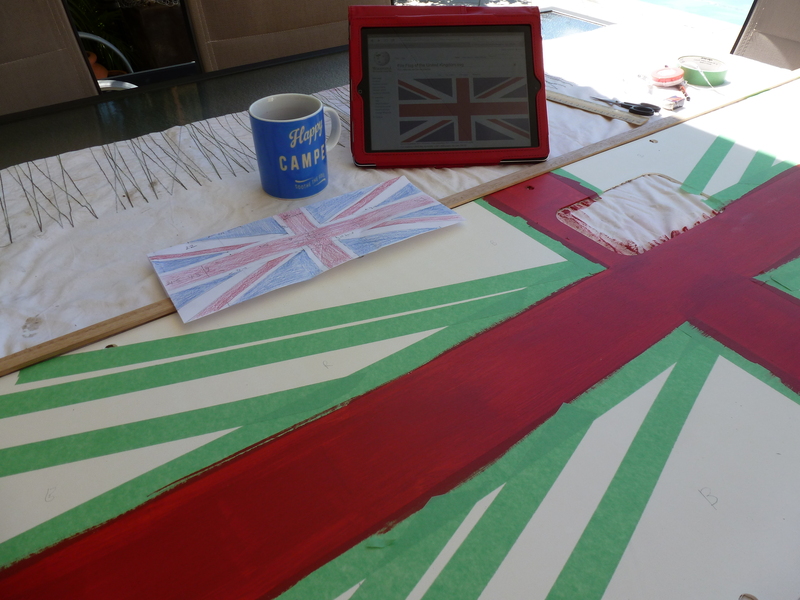 But on our return from the UK a couple of weeks ago, where we’d been surrounded by a sea of patriotic memorabilia, this dull, wooden panel suddenly became a canvas of possibility. What are we doing painting it white?! Surely it is crying out for a union flag! 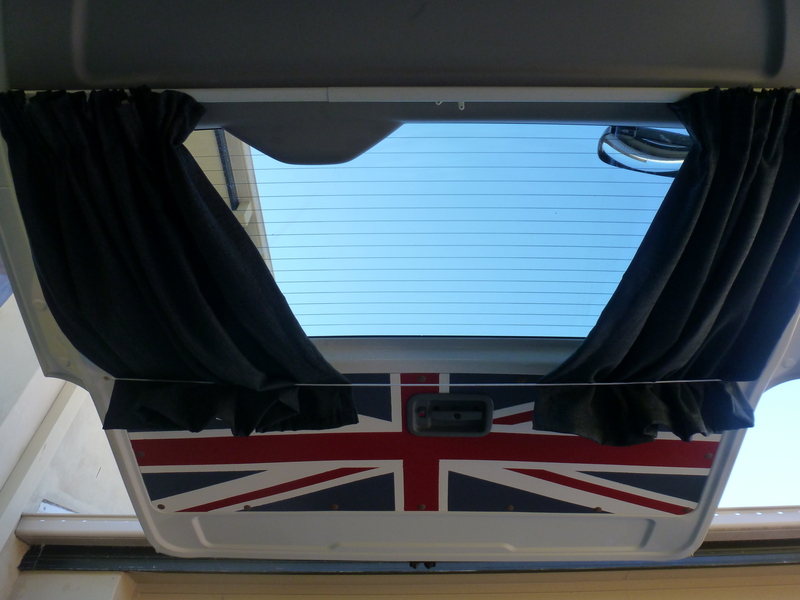 And while I’ve probably missed the boat in terms of celebrating this year’s fantastic Great British events, it still seemed a timely opportunity to add a little (more) red, white and blue to our now very colourful campervan. Paul painted a couple of white undercoats on first, and we went to Bunnings to colour match the blue with that of the curtains, so it didn’t clash too much. 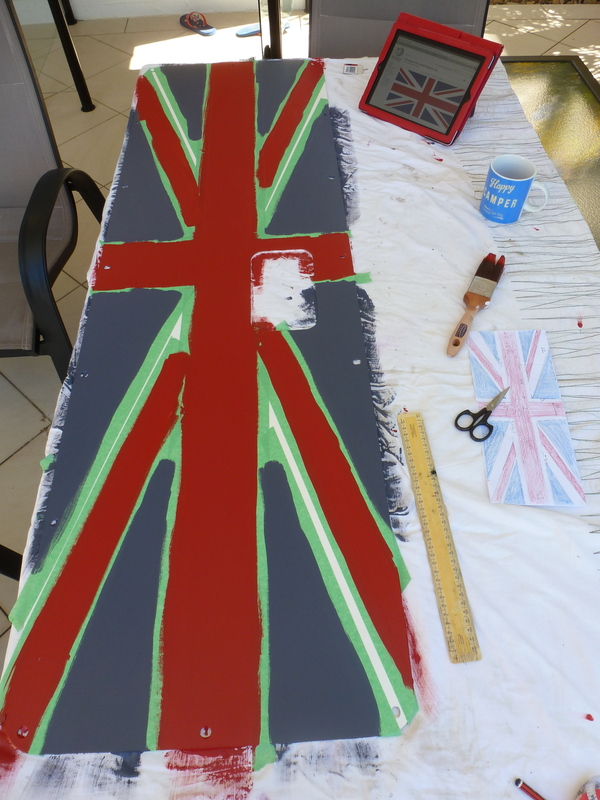 Then it was just a case of painting the red and blue in the right spots, and praying that the masking tape would survive three coats of paint. It didn’t… quite. I waited until everything had dried and pulled the tape off very gingerly, but it had bled through on most of the lines. Still, we think it can pass for a vintage look, and when you stand back in the van, it’s not too obvious. 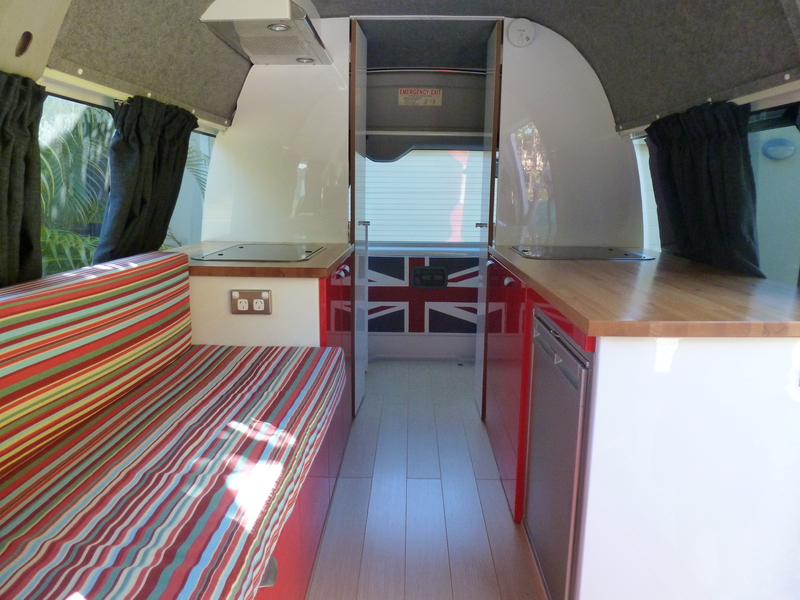 This entry was posted in Building a diy campervan, Campervan - the finished result!, Campervan interior design and tagged patriotic campervan, red, Union flag, white & blue by Rach. Bookmark the permalink. Hi there, most impressed after reading your entire thread. Great work! Thanks for your reply to my other comment asking about your insulation. 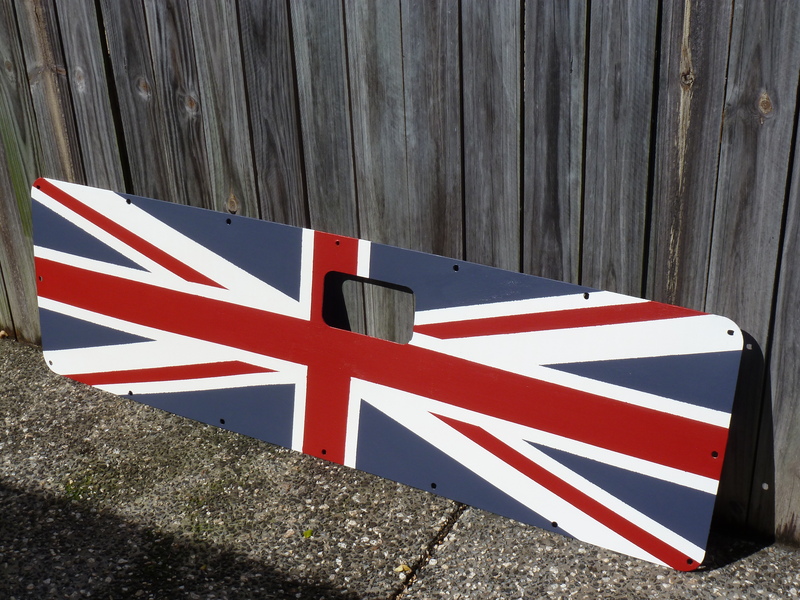 I have another question, I don’t suppose you could tell me how you removed the inside doorhandle on your tailgate to get your panel off and then the union jack painted panel back on? I have the same kind of panel on my rear door and I can’t figure out how to remove it. Hi – thanks for your kind comments! Our handle was quite simple to remove so maybe yours is different? Ours just had three screws in so we could unscrew that first, then gently pull out the pins that secured the wooden panel. Do you have a Toyota Hiace? No I have a Ford Econovan. The handle LOOKS the same, but I am assuming there are mechanisms at the back which are holding it on even when I undo the screws. I haven’t been game to pull the handle out against resistance in case I break something, or can’t figure out how it goes back together. Did you have to release any mechanisms at the back of it? It sounds like the handles might be different, ours literally just had three screws and then it came off easily. Ford must be trying to stop you from painting a union flag on the back! Good luck.